by M H Ballie Scott and made by John Broadwood. 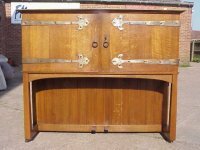 An Arts and Crafts oak Manxman Piano with hand formed iron wrap round hinges and little ring pull handles. The top folds back and over and then can be hitched open which allows more sound out when played. The twin doors opening to reveal the piano keys with three original stylised floral embroidered panels with butterflies and chrysanthemums which are still as bright and vibrant as the day they were made. The embroideries are flanked by two stylised floral hand formed steel and brass sculptured candle sconces, works of art in their own right. Height 46", Depth 26", Length 56". Circa 1890's. 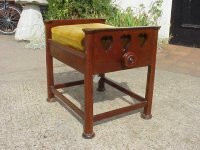 A rare Arts and Crafts music chair by Liberty and Co.
A good quality Arts and Crafts Cotswold stool with drawer and splayed legs united by H stretcher with protruding details attributed to Heals and Son, professionally re upholstered in a quality hide. 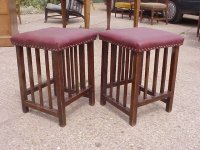 Two Arts and Crafts oak piano stool designed by Wilhelm Schmidt and made by Prag-Rudniker, in Vienna, with original fabric and Tulip style cut-outs to the top with three slats to each side and lower twin stretchers, and a cane seat version of this stool in stock. There was an identical version with cane seat for sale in Germany at Von Zezschwitz on the 30th June 2011 with an estimate of 1800 Euros. Height 19 1/2", Depth 17 1/2", Width 18". Circa 1901. 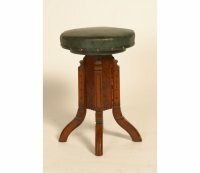 An Arts and Crafts adjustable piano stool by J.S.Henry with three pierced hearts to each side. Full height of seat when adjusted 22", Height to top arms 20 1/2", Width 22", Depth 17 3/4". Circa 1895. 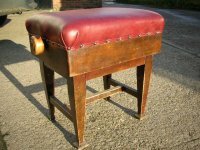 A good quality Arts and Crafts adjustable piano stool with pierced Tulips all around the top and turned legs with circular details to the tops and mushroom style feet. The adjustable mechanism works with a hinged internal flap that is folded up to make the seat higher (see last two images). Height 21 1/2", Height with the flap up 24", Width 20 1/4", Depth 14 1/4". Circa 1900. 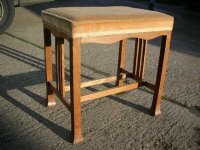 A super quality craftsmans made Arts and Crafts oak stool with slatted sides and exsposed dowels. 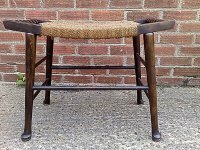 An Arts and Crafts piano stool with seagrass to the shaped seat and Bobbin turned detail to the arms on pad feet. Height 20", Width 25", Depth 13". Circa 1895. A British Arts and Crafts/Art Nouveau Mahogany upright piano the design attributed to G.M.Ellwood and made by John Brinsmead one of the best English piano makers of the period with wonderful stylised floral inlays to the front and sides and fine string inlay to the front uprights. Height 50 1/2", Depth 27 1/2", Width 57" from cap to cap. Circa 1900. An Arts and Crafts Walnut piano stool attributed to Liberty and Co, with wonderful stylised floral inlays to the sides and chequered inlays to the legs and cross stretchers with lift up seat for storing music sheets. Height 26", Length 18 1/2", Depth 14". Circa 1900. 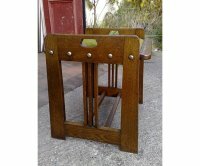 The other is ready for upholstery of your choice £250. Full height of seat when adjusted 20 1/2", Width 20 1/2", Depth 16". Circa 1900. Aesthetic Movement Walnut adjustable revolving stool with stylised floral incised details to the base on splayed legs and has been proffessionally re upholstered in a quality hide. The stool has a lowest height of 18 1/2" but will adjust upto 24" high and is 12" across the seat. Circa 1880. 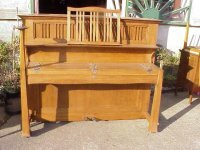 An oak Arts and Crafts Manxman Piano designed by M H Ballie Scott and made by John Broadwood. John Broadwood were the best British piano makers of the period in the UK. It is in wonderful original condition, a unique concurs example with original finish and hand formed iron wrap round hinges and little ring pull handle. The top folds back and over and then can be hitched open which allows more sound out when played if required. The twin doors opening to reveal the piano keys and two stylised floral craftsman hand formed steel and copper sculptured candle sconces. 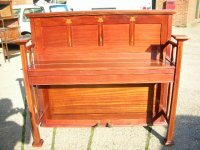 The movement has been totally refurbished by the previous owner and it is probably one of the very best example's of this type of piano to come onto the market. Walter Cave, made by Bechstein An oak piano with an overstrung upright underdamper action, having seven (seven and a quarter octave) with ivory keyboard. Exhibited in the 1893 Arts and Crafts Exhibition. Walter Cave was articled to Sir Arthur Blomfield and set up his own practice in London in 1889. He was a member of the Art Workers� Guild and used forms of expression very close to those of C. F. A. Voysey, and in 1897 took over one of Voysey�s commissions, a house in Streatham Park, London. Height to top of sheet music stand 52", Depth 26, Width 60 1/2". 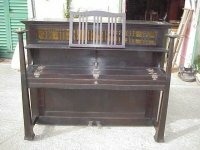 I do see this piano from time to time if you would like me too find one or let me know when I get another please do e-mail me. Walter Cave, made by Bechstein. A dark oak with an overstrung upright underdamper action, having seven (seven and a quarter octave) with ivory keyboardand and was exhibited in the 1893 Arts and Crafts Exhibition. Walter Cave, made by Bechstein. 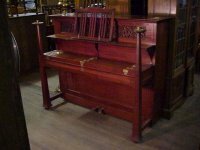 A mahogany piano with an overstrung upright underdamper action, having seven (seven and a quarter octave) with ivory keyboard. Exhibited in the 1893 Arts and Crafts Exhibition. 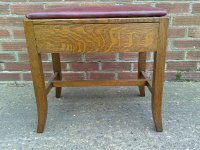 A Mahogany piano stool with Heart cut-outs to each side and adjustable seat attirbuted to LandCo. £SOLD.